Istanbul is Turkey's most populous city, and its cultural and financial center. It is located on the Bosphorus Strait, and encompasses the natural harbor known as the Golden Horn, in the northwest of the country. It extends both on the European (Thrace) and on the Asian (Anatolia) side of the Bosphorus, and is thereby the only metropolis in the world which is situated on two continents. Mihrabat Nature Park (Turkish: Mihrabat Tabiat Parkı) is a nature park located on the Asian part in Beykoz district of Istanbul Province. 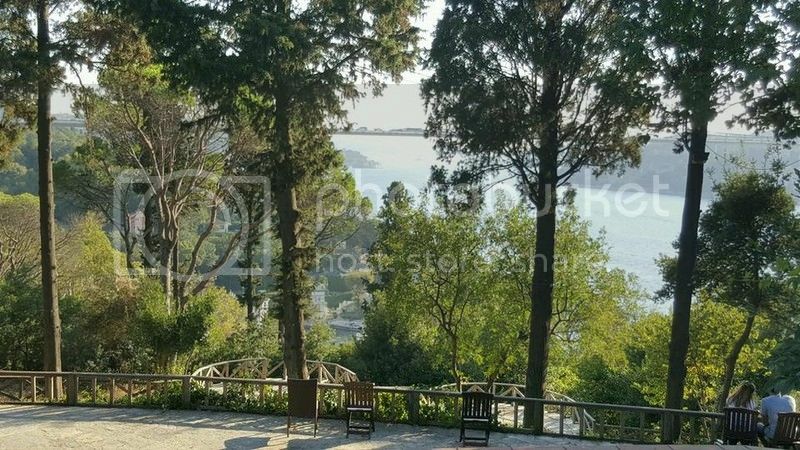 Situated southeast of Kanlıca neighborhood of Beykoz next to the Bosphorus, it covers an area of 20.12 ha (49.7 acres). Mihrabat Grove is situated on a hill, overlooking the Bosphorus from Asia. It has one of best views of the water and the Bosphorus Bridge. The nature park offers outdoor recreational activities such as hiking, cycling and picnicing for visitors on daily basis. There are open-air basketball courts and football field. Access to the nature park is at Mihrabat Cad. 50. Admission is charged for visitors and vehicles. There are variety of gardens as well as with monumental cypresses, umbrealla pines, Judas and bay trees. Mihrabad Grove is also a favorite place for the ones who want to have an open buffet breakfast and dinner at the weekends. It is one of the best parks and gardens in Istanbul. The park has a cafe-restaurant where you can enjoy tea, a meal or nargile. Families with children are welcomed because there is children playground. It is argued that Mihrabat Grove was named after the Mihrabat Palace, built by Damat İbrahim Pasha and given to Sultan Ahmad III as a present. Unfortunately, the palace was destroyed during the riots of the janissaries. Despite its glorious history, Mihrabat Grove has been reduced over time, but it still features small bridges and underground water reservoirs. Mihrabat Grove is located on a hill with a view of the entire city; it was created by Sultan Mahmud I in Kanlıca. Mihrabat Nature Park has a 400-car parking lot and is able to seat 2,500 people. There are two grand halls where large events including weddings, training sessions and business meetings are held. The restaurant and cafe are the most popular places in the grove. There is also a park for children to play in. An open-air restaurant and a snack bar serve the visitors. Use of the nature park for events like weddings, music concerts and meetings is also permitted. The nature park is the habitat for diverse species of plant with deciduous trees in the majority. Present deciduous vegetation include common hornbeam (Carpinus betulus), sweet chestnut (Castanea sativa), oriental plane (Platanus orientalis), silver linden (Tilia argentea), kermes oak (Quercus coccifera), Irish oak (Quercus petraea), Norway maple (Acer platanoides), Balkan maple (Acer trautvetteri), crepe flower (Lagerstroemia indica), Mediterranean hackberry (Celtis australis), cigartree (Catalpa bignonioides), Judas tree Cercis siliquastrum, common ash (Fraxinus excelsior), silver wattle (Acacia dealbata), cherry plum (Prunus cerasifera) and southern magnolia (Magnolia grandiflora). Present conifer trees are stone pine (Pinus pinea), Himalayan cedar (Cedrus deodara) and Syrian juniper (Juniperus drupacea). Foliage plants are Mediterranean cypress (Cupressus sempervirens), giant cedar (Thuja plicata), oriental cedar (Thuja orientalis), (Lebanon cedar (Cedrus libani) and Greek juniper (Juniperus excelsa). European ivy (Hedera helix) is found in the nature as creeper plant. On the hillsides, flowering plants such as stonecrops (Sedum hispanicum) and (Sedum spurium), oleander (Nerium oleander), rosemary (Rosmarinus officinalis) and nandina (Nandina domestica). Shrubs in the park are goat willow (Salix caprea), bay laurel (Laurus nobilis), Chinese photinia (Photinia serratifolia), laurestine (Viburnum tinus), strawberry tree (Arbutus unedo), English dogwood (Philadelphus coronarius), European holly (Ilex aquifolium), salt cedar (Tamarix), weaver's broom (Spartium junceum), scarlet firethorn (Pyracantha coccinea), blackberry (Rubus), Australian laurel (Pittosporum tobira), butcher's broom (Ruscus aculeatus), tree heath (Erica arborea), Japanese privet (Ligustrum japonicum), green olive tree (Phillyrea latifolia), dog-rose (Rosa canina) and common medlar (Mespilus germanica). Observed bird species in the nature park are sparrow, dunnock, common raven, woodpecker and European goldfinch. Other animals found in the park are hare, squirrel, tortoise, lizard. These scripts and photographs are registered under © Copyright 2017, respected writers and photographers from the internet. All Rights Reserved. In its long history, Istanbul served as the capital city of the Roman Empire (330-395), the Byzantine Empire (395-1204 and 1261-1453), the Latin Empire (1204-1261), and the Ottoman Empire (1453-1922). The city was chosen as joint European Capital of Culture for 2010. The historic areas of Istanbul were added to the UNESCO World Heritage List in 1985.